It has been a few weeks since I last posted, although my Utah Jazz Manifesto was long enough to make up for it. I also appreciate and sympathize with anyone who read it. I wouldn’t say that I got in trouble, exactly, for my burst of prolificity, but The Wandering Moose expressed her displeasure with having to read something so lengthy. In the past version of this blog she would have simply ignored it and been happy, but she feels a bit more ownership now that her name is on the blog, and wants to make sure that the product is acceptable. TWM also predicted that nobody would want to read something I wrote that was that long, which turned out to be true. This has caused me no end of concern, as I am currently writing a book that is already many times longer than the post in question, and I would like people to read that someday. To be fair, there is a clear difference in an actual book and a foolish, self-obsessed blog post – but that didn’t keep me from worrying about it for a few days. I posted that poor decision the day before what would be the final Utah Jazz game of the season, which would then be followed by one of the strangest things that has ever happened to us. The evening went like this: we watched the game until late, due to an 8:30 PM starting time here in Salt Lake City. The Utah Jazz lost, ending their season, which was unfortunate. But, they didn’t play well enough to win, and there were too many “absent” players, and the officiating in the fourth quarter was rousing, to be kind about it. The fact that the Jazz couldn’t hit a shot through the entire game, and Odom, Gasol and Fisher looked like Hall-of-Famers instead of famous chokers didn’t help, and, and… well, nothing. I sense a rant coming on, which I thought I had all out of my system. I will end it here, so I don’t find myself on the wrong end of another “manifesto.” Better luck next year, Jazz. Anyway, after the game we were feeling sad about things (well, I was feeling sad – TWM was doing okay) and we ate a very late dinner while watching a few TV shows recorded on our DVR. Neither of us had really noticed how late it had become, because we were enjoying each other’s company, and it was Friday night with no early responsibilities the next day. It was about 1:15 AM, and that was when the aforementioned “strangest thing” happened. Most disquieting for us is that it seemed to be coming from just outside our door. I ran (well, jogged) to the window and TWM sprang to the door. We discovered that it actually was coming from right outside of our door – a white Ford Mustang surrounded by a cloud of dust was in the middle of our front yard. We saw it back up and go tearing out to the street, and then disappear around the nearest corner. We spent the next hour calling the police (I made my first call to 911 – which was thrilling in its own way), consoling the driver’s hysterical girlfriend, theorizing with the neighbors, and assessing the damage. We also watched as the yard demolition specialist returned in his Mustang to see what he had done, followed by one of our neighbors chasing him down the street to get his license plate. The good news was that nobody was hurt, and in fact, there was minimal damage considering what could have been. 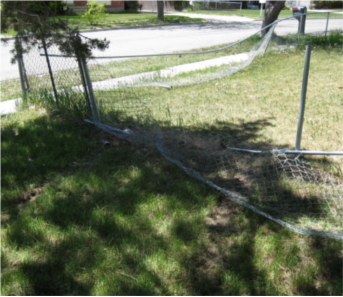 Our neighbor’s chain link fence was mangled, and there were some tire marks left in the grass, but nothing critical. We found out at the time that he had been drinking, had a sh outing match with his girlfriend, leaped into his overpowered car, and sped off to show his displeasure. We guessed that he swerved to avoid a big truck parked on the corner of our street, overcorrected (to say the least) and blasted through the fence. Once the adrenaline high was over and after a thorough flashlight inspection, we determined that just about everything was fine, and had a good chuckle about it. We ended up turning in at about 3:00 AM. The police found the driver the next day, and soon discovered that he wasn’t carrying insurance (which didn’t really surprise us, considering) and that he had stopped paying for his car several months ago. This meant that he was basically driving a stolen car without insurance. It was also an interesting conclusion to a rather bizarre night. I have a few more things to write about, but I will end this here so I don’t make the same mistake as last week. More to come soon. Good to hear that no one was hurt, that is always the biggest concern really. (Most) Property you can replace (well, stuff like photographs are a tad harder obviously), but human (or animal) damage is not that easy to mend. Very nice of him to carry no insurance either, somehow I think that that will make the whole incident even more annoying for him than it actually is. And to add to the story – we haven’t tried our sprinkler system since the “accident”, so we have yet to find out the real damage to our property. I’m keeping my fingers crossed, but with our luck I’m sure there will be a broken line in the middle of the yard that will take hours of back breaking work to fix. An interesting evening, indeed! Hmm… I may have SLIGHTLY exaggerated TWM’s reaction to the length of my Jazz post, as well as made it sound SOMEWHAT more concerning to me than it really was. All done for the sake of trying to be funny, but I didn’t consider how it could possibly make her feel badly.